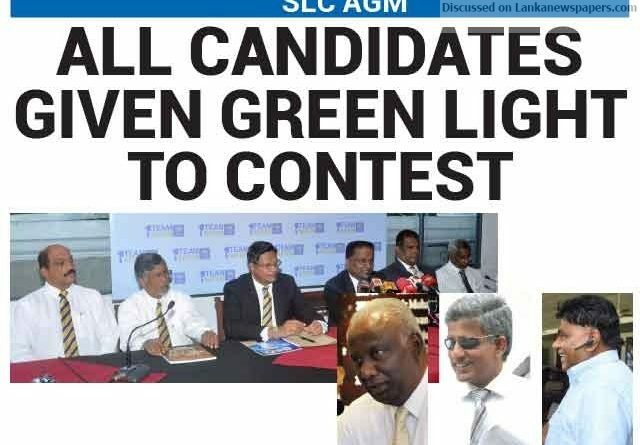 Four prominent figures in cricketing circles – Mohan de Silva, Kangadaran Mathivanan, Shammi Silva and Jayantha Dharmadasa – were given the green light to contest for the Presidency of Sri Lanka Cricket, which is scheduled for next month. This was disclosed by the three- member committee which was appointed to handle the nominations for the SLC elections by the Sports Minister, headed by the former Appeal Court Judge Justice P.W.D. Chandra Jayathilake, at the Sports Ministry Auditorium yesterday. After investigating the objections filed against some of the candidates, including the above, the three-member committee has gone through the complaints within the parameters of the Sports Law, decided to grant the four candidates permission to pursue with their campaigns. Only Gihan Weerasinghe’s application for the post of Assistant Treasurer was rejected, as he failed to qualify within the requirements of the laid down criteria. The three-member committee consisting of Justice Chandra Jayathilake, former High Court Judge, I.M. Abeyratne and Sunil Sirisena, a former secretary of the Education Ministry, refused to disclose the allegation levelled against these candidates at that point, but said they may reveal details on a later date after officially informing all candidates their eligibility to contest. The Sport Minister has also appointed a three-member Advisory Committee headed by Nimal Dissanayake, retired Supreme Court Judge, Devika Tennakoon, former Appeal Court Judge and Dharmasena Khandagama, former Additional Director of Sri Lanka Customs. A period of one week has been given to make appeals to the Sports Minister, who will share them with the above Advisory Committee for a final decision. ASSISTANT TREASURER: Bandula Dissanayake, Senarath Sanjaya Sedara, Nalin Wickremasinghe.